Under the category of restrictive diets, there might be one even strict than veganism: the world of the fruitarian. Steve Jobs was one, as was Ashton Kutcher, until he wound up in the hospital with pancreas trouble. Even Gandhi lasted on the diet for five years, before going back to vegetarianism (less notable fruitarians include dictator Idi Amin and white supremacist Ben Klassen). 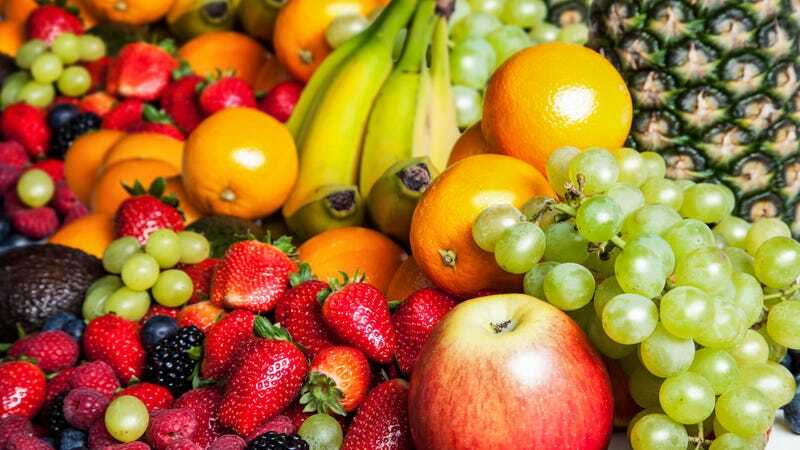 While you might question whether the sugar contains too much fructose, the natural sugar is balanced out by the plentiful fiber available, thereby putting fruit in the definite plus column for a daily diet. But keep in mind that too much fruit might wreck havoc with your digestive tract. Also, it should be noted that pureeing all that fruit into a smoothie can lessen the health benefit, as the process eliminates the fiber while keeping all the sugar intact. But since most of us fall short of our daily five to seven servings of fruits and vegetables anyway, aiming for that amount remains a sensible guideline. Read more at Time.com.